The display of tailored luxurious automobiles, horsepower-heavy sports cars, tech-savvy mainstream vehicles and thoughtful budget run-arounds at the 84th International Geneva Motor Show reveals the complexity of the car industry. This is a business that is increasingly under pressure to perform, to keep up with technology and to provide for a demanding global market. Economic uncertainty in Europe and elsewhere has had a significant impact - though with the first signs of growth here, things appear to be on the up and the Geneva Motor Show certainly exhibits a dose of optimism. In comparison to Frankfurt, Paris and Detroit, Geneva is a more pleasant show to navigate. The smaller halls dictate more modest pavilions as well as a more democratic integration of brands. So superpowers like the Volkswagen Group shared their space with the design firm Pininfarina, and Rolls Royce was forced to sit face-to-face with the brash tuning house Mansory. Whether positive or not, it certainly creates engaging dialogue. The Lamborghini Huracán was unsurprisingly a genuine showpiece. This is a seriously handsome car, even more so in the flesh. One of the show’s first debuts, it stood head-to-head with a wave of exclusive fast cars, including the heavily revised Ferrari California T, McLaren 650S and Bugatti’s 2.18 million-euro Rembrandt edition. 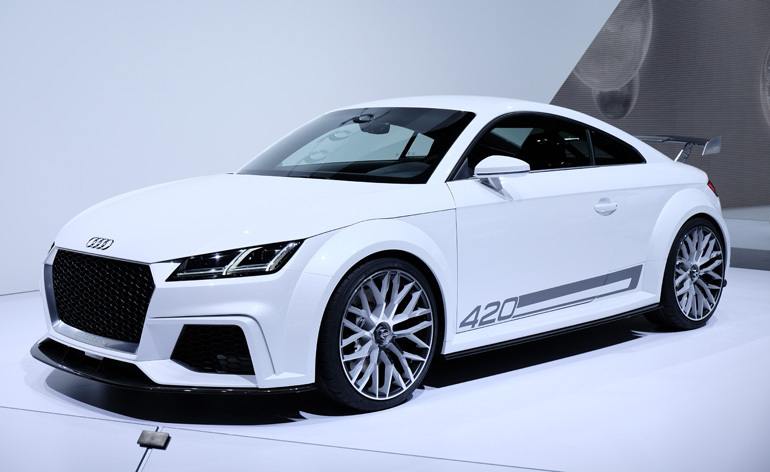 The third-generation Audi TT was one of the most anticipated show cars and also polarised the critics. The original TT, with its unique exterior, almost became its own sub-brand within Audi. The latest car, though without question supremely executed - the sharpness, the precision on the all-aluminium body itself is to be commanded - feels more car-like, less like product design and much more in keeping with the ever-expanding Audi family. Elsewhere, Maserati created a similar stir. Celebrating its centenary this year, the marque is in the midst of an impressive expansion programme that includes the Ghibli production car, the SUV concept we saw in Detroit and this latest Alfieri, in our opinion a stunning design inspired by one of Maserati’s most evocative cars of all time, the A6 GCS-53. Less controversial, though no less impressive, is the S-Class Coupé. Mercedes-Benz’s flagship car is softly spoken and sophisticated on the outside, the interior a portrayal of uncomplicated luxury. It is a welcoming departure from the more brash design language of late and nods to a fresh direction for the marque. Jaguar teased with a brief glimpse of the aluminium-bodied XE small sports saloon on the eve of the show, though the car never made it to Geneva, presumably saved to wow on a more exclusive occasion. This sub £30,000 car is a hugely important car for the marque that seems to do no wrong, and is expected to perform the same economic miracle as the Evoque did for sister brand Land Rover. Another fresh approach came via Volvo. Concept Estate is the last of a trilogy of cars penned by the new design director Thomas Ingenlath that reveals a stronger visual identity for a marque that hasn’t quite found its feet under its new Chinese owners. The new modular platform promises great things and it’s also satisfying to see Volvo return to what it does best - estates. BMW’s 2 Series Active Tourer reveals the incredible diversity of the marque, determined to enter every conceivable sector and creating plenty of new ones on route. The Active Tourer is a departure for a company famed for its driving machines, yet the inspired package will no doubt attract even more customers to the brand. A handful of interesting, more affordable cars also caught our eyes. The Citroën C4 Cactus, among other imaginative qualities, features air-filled panels that protect the bodywork from low speed scrapes. Opel/Vauxhall’s Adam Rocks has a fun retracting canvas roof, and Adam S offers something in the region of 30,000 colour and trim options for a highly personalised small car destined for the masses.